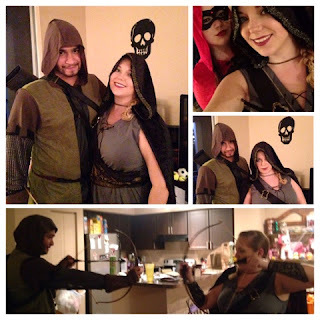 Hello Wench: My Halloween Party! So this past weekend I threw an amazing Halloween party. I spend the entire week before the party panicking and freaking out about food and who was coming and all the small details. I freaked out for absolutely no reason, only 2 people cancelled, and some people brought +1's. It started at 7pm, and the plan was to have everyone eat dinner at 8. And while that didn't go to plan, everything else did. I tried channeling my Grandma (who may be my hosting/party spirit animal) and had lots and lots of chips and salsa and horderves to eat before dinner. I ended up having a lot more than I even expected after people showed up and brought stuff. For dinner I made lots and lots of taco stuff. Chris made his Mom's delicious shredded chicken recipe and I made regular beef taco meat. Then we had every single topping you could really ever want to put on a taco. We had both hard shells and soft shells and everyone stuffed their faces until they literally were like "Jenn I ate too much you had soooo much food." And that was even before dessert. My best friend made Owl cupcakes that were decadent chocolate cupcakes with chocolate frosting topped with oreo cookies and M&Ms. And then someone else brought even more vanilla cupcakes with giant candy corns on the top! Then the plethora of sugar cookies and chocolate chip cookies were abound. And candy. So. Much. Candy. Overall it was a great time and I'm thinking of hosting another party/game night/friends night sometime again because even though it was a lot of work, it was also a lot of fun!